This quilt has been finished for a couple of weeks now; I’ve just been a slacker about writing a final post about it. So let’s see…. It started with this graphic that I fell in love with. I became a little obsessed actually. Eventually, I made the top because I just *had* to explore this. Then came the class, where I put together a tutorial for folks to make a smaller version that would work as a crib quilt. At approximately 48 x 72 inches this one is too big to be a crib quilt but maybe too small to be a throw. It is, however, ideal for a certain toddler’s bed especially being as he seems especially fond of it. I can’t unfurl this quilt with him in the room as he immediately runs over to grab it and hug it, which is kinda the most awesome reaction I could hope for. I have to admit, this is my favorite quilt that I have made so far. And? It was really easy to make. In fact, I encourage anyone who likes this to make themselves a quarter circle template and get sewing. 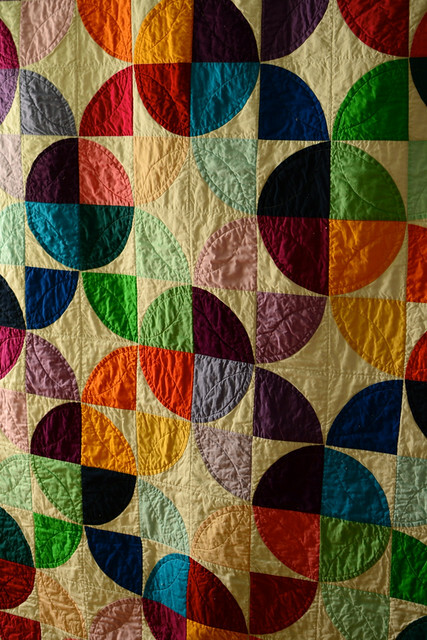 Quarter circles are super-easy to sew. I don’t bother with all the pinning when running them through the machine. I just ease the fabrics together gently at the curve (without any pulling or stretching) with a slight overhang at the beginning and the end of the seam and zip along. The most time-consuming part of the process is probably trimming all my squares down to size before I start piecing the quarter circle squares (drunken steps?) together. As far as quilting it, the design lends itself to a plethora of quilting options. I chose a pretty obvious one – circles within the circles and implicit circles – but it works well. I went with a white binding because it just worked best with the clean, modern aesthetic of the quilt. It’s almost like an invisible binding since it blends in with the background fabric. I like that – it’s understated and quiet yet ties everything together. And of course (OF COURSE!) I have to include the detail shot of my corners. Really, neat corners are so very satisfying. So this one is going to be on display at gather here for a couple of months, and then it will go to my little dude for being so awesome about adjusting to his new bed and making this period of transition so smooth and stress-free. I have a feeling he will be extremely happy to see it again. stunning quilt. really just beautiful. It's just gorgeous! A modern look in a traditional medium… match made in heaven. This is exquisite. I can imagine a tiny one with rounded corners that would be lovely hanging on a wall. I absolutely LOVE this quilt. You've inspired me to drag out my sewing machine again. Such a lucky boy! This is so stunning that I can hardly stand it! so great, Maritza. ummm you are amazing! your eye for color is wonderful. and i can't blame finbar for loving this quilt. i want to run over and grab it and hug it, too! Did you make a quilt pattern for this beauty that would be willing to share or sell? I love this quilt so much! You have created a gorgeous piece of art! I would love it if you could offer me some advice on fabric requirements etc or if you are selling the pattern I would love to know where to purchase it! This is so gorgeous! I know lots of others have commented for a pattern too. Is there anything you can point us in the direction of to make something similar? I love your neat corners- best feeling ever huh! I absolutely love it! Did you make a quilt pattern that would be willing to share or sell? This is a gorgeous quilt. I'm rather new to quilting and have been afraid of the the quarter circles, but you've inspired me to try my hand at this quilt. I want to make something like this for my brother and soon-to-be sister-in-law for their wedding quilt. This is such a beautiful quilt! Lovely work. I would love to try to make this. Do you have a pattern? Is this something I could do being a new quilter? I also would love to make this quilt and was wondering if you have a pattern for sale, This is one fabulous quilt!